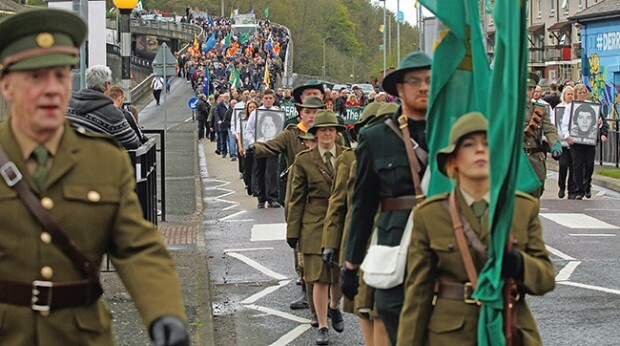 THE PERSONAL STORIES of former POWs were at the heart of a series of events organised over the May bank holiday weekend to mark the 35th anniversary of the 1981 H-Blocks Hunger Strike. There were extremely moving discussions as men and women who experienced the depredations of the H-Block and Armagh protests, including hunger strike, gave their testimony to packed audiences in Belfast. 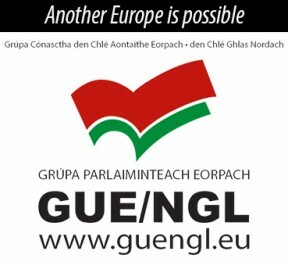 And on Sunday 1 May, thousands of republicans took to the streets of Derry to march in honour of the 10 men who died in the epic battle against the Thatcher regime in Westminster and with their sacrifice and commitment destroyed Britain’s attempt to criminalise the Irish liberation struggle and the political prisoners. 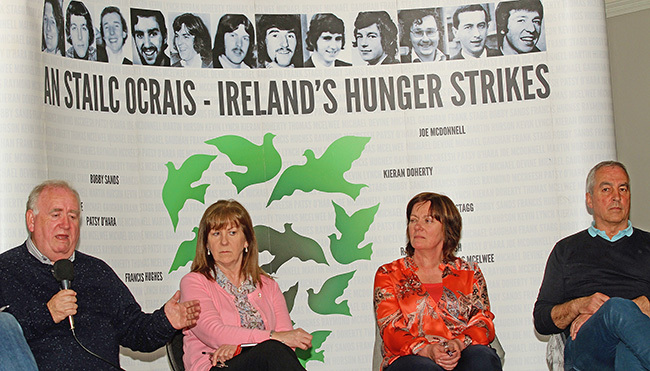 The series of Belfast panel discussions was kicked off on Thursday when former hunger strikers Raymond McCartney, Mary Doyle and Pat Sheehan spoke of their personal experiences and the thinking behind their decisions to become involved in struggle. The backdrop to Mary Doyle’s story was the the unionist attack on Conway’s Bar (later renamed the Boundary Bar), on Belfast’s Shore Road, in which her mother Marie was killed. For Raymond McCartney, growing up in Derry in the 1960s and witnessing at first-hand “The Battle of the Bogside” and Bloody Sunday influenced his decision to become involved in struggle. This in turn led him to the H-Blocks and hunger strike. 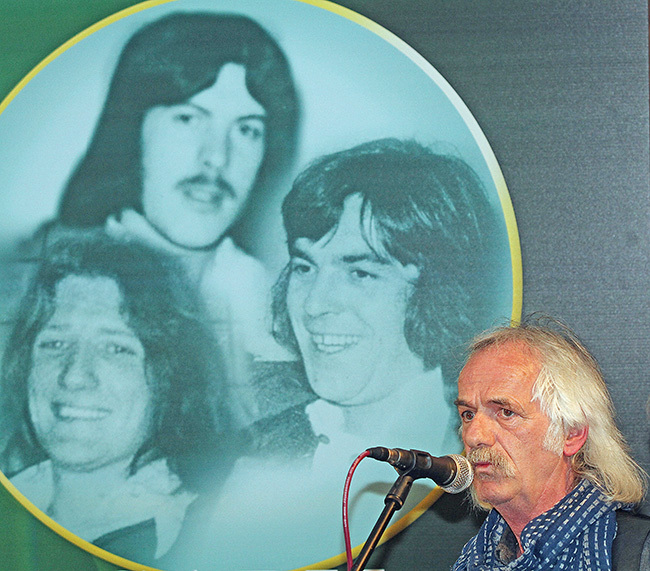 Five Years of Resistance, 1976 -1981: From Protest and Hunger Strikes to Funerals – was staged in the Felons’ Club in Belfast on Friday 29 April. It turned out to be a night in which the audience was captivated by the personal stories of five republican former prisoners – Bobby Storey, Fra McCann, Jennifer McCann, Pat Sheehan and Rosie McCorley – who chaired the event. Not many people would know, for instance, that Fra was one of a number of republican prisoners ‘on the Blanket’ in B Wing in Crumlin Road Jail where every day was a battle against isolation and a humiliating and degrading regime. When Jennifer McCann recounted the story of her arrest and eventual imprisonment, the presence of her friend and mentor Bobby Sands was very much part of the narrative. Not only that but her own strength of character shone through. When Pat Sheehan outlined his thinking and the decisions he made that saw him endure an ordeal such as 58 days on hunger strike, the audience was spellbound. The insights he gave were truly fascinating, especially dealing with the news that his sister had just been diagnosed with leukaemia. Likewise when Bobby Storey described the anger people felt after the British Army and RUC attacked the funeral of Volunteer Joe McDonnell and how they, after the news of Volunteer Kieran Doherty’s death, resolved that Kieran’s funeral wouldn’t attacked. The hundreds of people who turned up with hurls and the mobilisation of “black taxi” drivers who blocked roads at strategic points to prevent crown forces mobile units from a quick attack were evidence of a community response to what they saw as the desecration of Joe’s funeral. On Sunday 1 May, Jennifer McCann delivered the 34th Bobby Sands Memorial Lecture in the Andersonstown Social Club in Belfast. McCann recounted her experience of living in the socially-deprived Twinbrook Estate, on the outskirts of Belfast, and due to it falling within the boundaries of the unionist-controlled Lisburn council faced the mostly appalling discrimination. After Jennifer McCann finished speaking, Danny Morrison, in a surprise move took to the stage where he made a presentation to world-renowned muralist Danny Devenny. Praising “Danny D” for his commitment, creativity and integrity over many years painting murals that told the story of the republican struggle in its broadest political terms and in their highlighting the links with those involved in struggles throughout the world “from Cuba to Palestine”.